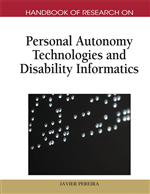 First this chapter will present an overview about assistive technology (AT). Next factors identified in the literature and thought to influence AT use will be presented. The second part of the chapter will present the findings extracted from a larger three-phase study, which aimed to obtain occupational therapists’ perceptions about AT non-use. Drawing from their experiences therapists identified the client-, AT-, intervention-focused factors which they had found to influence use. Some of these factors were similar to those identified in the literature, with therapists offering additional perspectives about the role these issues actually played in affecting AT use. In addition, therapists highlighted other important factors, not previously identified as influential or which had received little attention. Overall results showed support for a client-centred approach during the provision of AT. Suggestions were made to incorporate the Matching Person with Technology (MPT) model into current practice to guide the AT provision process. An integral part of the occupational therapy management of individuals with disability or dysfunction is assisting them in the successful completion of personally relevant activities of daily living (ADL). Such a goal may be achieved by programs designed to increase relevant performance components, activity adaptation and/or environmental modifications. Recommending AT is a frequently used element of therapeutic interventions designed to modify the person’s environment to facilitate optimal activity engagement. AT is usually recommended to enhance the client’s level of independence and promote the safe completion of essential daily tasks. Often though the use of recommended AT makes it possible for the person to engage in activities away from their home and within their community. This then has a markedly positive effect on their subjective wellbeing and provides them with a real sense of achievement (Mann, 2001; Schemm & Gitlin, 1998). Additionally, AT plays a pivotal role in the rehabilitation process by improving a client’s functional capabilities and assisting them in the transition from rehabilitation to home (Wielandt, 2003). In spite of the many positive outcomes associated with owning AT, there are diverse rates of AT use reported in the literature, ranging from 35% (Garber & Gregorio, 1990) to 100% (McGrath, Goodman, Cunningham, McDonald, Nichols & Unruh, 1985). In a recent study Scherer and Craddock (2002) reported that approximately 30% of obtained AT is either abandoned or discarded within the first year. In order to understand AT non-use various researchers have identified many factors (positive and negative influences), which have usually been based on the client’s rationale for non-use (Wielandt, 2003). These predominant factors can be arranged into three distinct groups: client-, AT- and intervention-focused. Client-focused factors include socio-demographics, diagnosis and perceived benefits of the AT itself. Influences in the AT-focused group involve functionality and aesthetic quality. Intervention-focused factors surround elements of the service delivery model including assessment, AT selection and training. Medical Model: Treatment focuses firmly on the person’s illness or disability and subsequent dysfunction and limitations. Traditionally therapeutic interventions are aimed at improving the person’s functional independence. Matching Persons to Technology (MPT) Model: Involves consideration of the needs of the person, their environment where AT will be used and characteristics of the AT itself before recommending AT to ensure a correct interface and decrease chances for non-use. Human Activity Assistive Technology (HAAT) Model: Considers the person, the activity to be completed, aspects of the AT and the context in which this interaction takes place. Client-Centred Approach: Involves a flexible collaborative therapeutic intervention with all stakeholders and includes personalised interventions that have a focus on the person-environment-occupation relationship. Assistive Technology (AT): Any item, piece of equipment or product system whether acquired commercially off the shelf, modified or customised, that is used to increase, maintain or improve functional capabilities of individuals with disabilities. Social Model of Rehabilitation: Emphasizes a collaborative therapeutic intervention that addresses both the importance of a person’s engagement in meaningful activity as well as facilitating their participation in wider society. Bain Assistive Technology System (BATS): Examines the needs of the consumer, the environment in which AT is used, the characteristics of the AT and the task to be undertaken. All elements are considered to be integral. Occupational Therapy: Use of meaningful occupation to assist people who have disabilities in achieving a healthy and balanced lifestyle and to enable an inclusive society so that all people can participate to their potential in daily occupations of life.